Welcome to Issue 7 of The Edge of Service. You are receiving this new newsletter as a friend or colleague, or because we've connected or interacted on service topics. If you choose, you can unsubscribe by clicking unsubscribe. My family owns a vacation home near a small stream that runs through Idaho's Wood River Valley in the Central Rockies. Each spring, when higher elevations melt, our beautiful little stream turns into a roaring river that carries several times the normal water flow. It's beautiful and awe-inspiring. Our mistake led to the problem. But now we need help that we're not receiving. We'll get to the bottom of it (at some expense to their productivity and mine), but this lack of ownership drives consumers crazy. (Candidly, I find my own experiences—good and bad—to provide fascinating and complementary insight to both industry research and what I see on the inside of these operations.) Beyond all of the usual suspects—processes, empowerment, metrics, etc.—a company's culture is a powerful (perhaps THE most powerful) force behind the customer experiences it is creating. Culture is top-of-mind in today's most customer-focused organizations. It likely always has been, but I'm seeing a marked increase in requests to "discuss culture" when speaking to groups or looking at industry trends with executive teams. The challenge, of course, is that the term can refer to so many different things. Companies have cultures, and they serve customers and regions with unique cultures. There are different cultural expectations by generation. Even communication channels tend to have their own unique cultures and expectations (e.g., long sentences in Twitter look silly, but abbreviations and emoticons in an FAQ doc would be inappropriate). 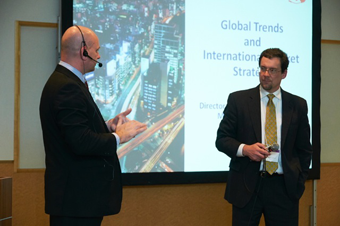 Cy West, who is Director of Global Sales for Marriott International in Japan, and I recently co-presented a session on global service trends to a group of customer experience leaders in Tokyo. Marriott is consistently rated as a top-tier company in customer service and loyalty, and Cy helps reveal why. As process-oriented as hotels are (and Marriott gives lots of attention to processes and systems), he stresses "intuition," "understanding," "flexibility," and "empowerment"—these are ingredients to the secret sauce when serving a culturally diverse customer base. Great organizations also pay a lot of attention to generations. While stereotypes can be overplayed, the cultural differences between Boomers, Generation X, Generation Y, and Generation Z are real and well documented (these short videos provide very good summaries). At the invite of the ICMI conference team, my daughter Grace, who was nine at the time, helped me kick off ICMI's large 9th annual conference. (She loves to present and jumped at the opportunity, even earning some extra credit from school; it was a special once-in-a-lifetime morning for both of us!) She's on the young side of Generation Z, the oldest of whom are just finishing high school, and as we prepared our dialog before the event, she helped me see differences in perspectives more clearly. And how about the culture of your own organization—those inveterate principles and values that guide behavior? How do you cultivate a culture that builds your brand and enables your team to serve a fast-changing and diverse customer base? While I don't believe there is a simplistic formula, a few steps consistently stand out. Start by viewing culture as a leadership responsibility—don't leave it to chance. Hire well. Give your teams a good understanding of your customers, and to Cy's points, arm them with the flexibility and empowerment they need to respond. Capture and share stories of reps who go above and beyond to solve problems. And live by your mission and values, so that they really matter. Respondents who say customer engagement and loyalty is an important priority in their organizations. Yet, 27% say their C-level executives have ownership in the customer engagement strategy. Source: ICMI's research report, Customer Experience Management in Action, 2013. Dollars at risk to U.S. businesses as a result of American households' most serious problems with products/services in 2013. Source: The 2013 Customer Rage Study, conducted by CCMC and Novo1, in collaboration with Arizona State University. What one area is the most exciting opportunity for your organization in 2014? Source: The 2014 Digital Trends report from Econsultancy and Adobe. These figures reflect company respondents to a global survey of over 2,500 marketers and Internet professionals. How well is your culture supporting your vision and brand? Are you providing your teams with a basic an understanding of the cultural expectations of your customers (consider the countries you serve, languages and backgrounds, communication channels, generations, etc.)? Do your agents have the flexibility and empowerment they need to respond appropriately? Are you capturing and sharing stories of team members who go above and beyond? Are you living by your mission and values? Orlando, March 4–7, 2014. Two–Day Workshop, Essential Skills and Knowledge for Effective Contact Center Management, for ICMI. San Diego, May 6–9, 2014. ICMI's Contact Center Expo and Conference. Toronto, June 17. Full-day seminar, Foundations of the Future Customer Experience Center, for Execs in the Know. Article, A Dozen Ways to Cultivate Customer Relationships.